To all zone presidents: This season’s supply of purple blankets is on the way. Everything will have been shipped across the country to each zone president by the end of September. This means that every zone will receive them by mid-October at the latest. Please note that you will receive blankets only this year — no banners or posters. We recognize that some resorts have problems with losing blankets to hospitals, that’s why everyone receives an annual top-up from IBAC. We recommend labelling or stencilling the blankets before putting them into circulation. 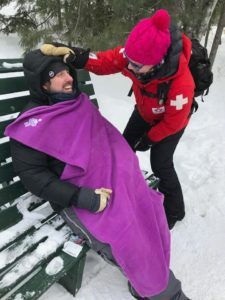 Remember, the blankets are considered to be CSP equipment for everyday use in training, special events, patrolling, performing first aid and use while supporting events. Be sure to distribute them to all patrols throughout your zone. Over the past 11 years, IBAC and the CSP have forged a terrific partnership in which both provide an investment and both receive benefit. We receive high-quality, functional blankets for use in all patrolling needs and duties. IBAC receives nation-wide reach and broker recognition among the sporting public. In the end, both enjoy the promotion of our combined mission to promote safety and accident prevention. Please help to continue the visibility of this partnership by using the blankets for their intended use. Our goal is to maximize their exposure with the skiing and boarding public. Photos of the blankets in action with our new uniforms are greatly needed. Please take a moment to send your photos to me at sheila.reesor@skipatrol.ca or via Dropbox. Further background information about this program can be found on the national website, under Support/Partners.